"It's a hell of a place to lose a cow." Joining other titles in the series such as Yellowstone National Park, Yosemite National Park, Glacier National Park and Grand Canyon National Park, Wilderness Video takes in two of southern Utah's natural attractions with Bryce & Zion National Parks.Both parks are part of the southwest's Grand Circle, a collection of national parks, historic monuments and recreation areas. Zion National Park lies just north of the Utah/Arizona border, and about 40 miles east of the Nevada border. The park was first established in 1909 as Mukuntuweap National Monument, but was retitled Zion in 1918 from the Mormon name for the canyon meaning "place of refuge." Covering 229 square miles, it was consolidated with Zion National Monument in 1956. The canyon reveals a rich geological history, as the area has at times been a sea bed as well as arid desert and has been traversed by rivers. The canyon was formed by the Virgin River, whose now tranquil nature belies its history in shaping the contours of this remarkable area. The sheer canyon walls lining the edges of the river feature layer upon layer of sedimentary rock, with bands of shale, sandstone, gypsum and limestone. What makes Zion unique however is its Navajo Sandstone, laid down some 170 million years ago. Our journey into the park begins with an aerial tour, introducing the multicolored sandstone cliffs, its hanging gardens, and lush vegetation in the lower regions of the canyon. While the area is an extension of the Mojave desert, it features a diverse range of flora, from the shrub live oak and junipers on the sun baked slopes, to groves of box elder, willow, cottonwood and ash in the lower canyon. We visit the waterfalls at the Temple of Sinawava, the Weeping Rock and then look over Angels Landing. We see mule deer and a host of insects at work on the wildflowers throughout the park. We watch storms brewing through time-lapse photography, and witness the winter snows as they blanket the landscape. Next we travel to the north east to another of Utah's unique attractions in Bryce Canyon National Park, which carved itself out of the eastern edge of the Paunsaugunt Plateau. This park was established in 1928 and covers 37,277 acres. The canyon was named after Ebenezer Bryce, one of a group of Mormons who settled in the area in 1875 and built his home next to it. The names of most of the features date back to the 1870s, when the area was inhabited by the Paiutes.Bryce Canyon features thousands of exquisite rock formations, including spires, fins, pinnacles and mazes made of limestone, sandstone and mudstone, collectively known as "hoodoos." These rim the canyon like fairy castles, exposing thousands of years of erosion by the Piria River, and the geological forces that began creating these landscapes during the Cretaceous period, some 100 million years ago, when the area was covered by the sea, which left layers of sediment, which were later covered by freshwater deposits during the Tertiary era between 40 to 63 million years ago. Ten million years ago, the earth split apart, shifting many of these rock formations vertically thousands of feet. As different layers of the rock erode, they create fantastic sculptures, including the Natural Bridge, and Thor's Hammer. Here, we fly past the Pink Cliffs with their incredible stone structures, in a vast range of colors and hues. We see the spires of the Fairy Castle, the Cathedral, the Boat Mesa and Fairyland Canyon. We view the canyon from Sunset Point, Paria View, and Inspiration Point, from the green of pine forests the golden trees in the autumn meadows. Finally, after watching Bryce receive a winter dusting of snow, we return to Zion National Park to witness a thunderstorm and watch a time-lapse sunset in the park. Like the other titles in the Wilderness Video National Parks collection, this hour-long show presents a montage of images from these two exquisite locations. The soundtrack blends location audio with a mix of classical, light contemporary and new age music, with no narration other than the infrequent hard subtitle denoting sights of interest. As an educational tool, this doesn't really suffice, given the non-linearity of the presentation, but as a visual presentation of the sights the parks have to offer throughout the seasons, it is quite enjoyable, and features some very stunning imagery. Image Transfer Review: Image quality is for the most part fairly good, with vibrant color saturation, and solid blacks. There are numerous minor dropouts throughout, and image sharpness is sometimes hampered by blooming from the video taped source. There is also a bit of soft ringing in high contrast areas such as the skyline. This isn't IMAX, but conveys the natural eye candy reasonably well. Audio Transfer Review: The stereo audio track presents the musical score adequately, with a full frequency range, and good separation. There was some noticible though subtle crackling in one segment. The segues between chapters seemed a bit rough, as though the cues for a different part were bleeding in. Overall, things sound quite good. Extras Review: No extras are provided. The 14 chapter stops are split onto two menu screens. 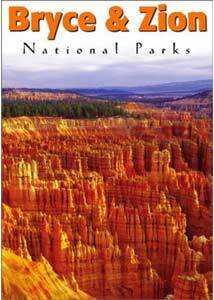 An enjoyable addition to the National Parks collection, this time visiting two of Utah's premiere attractions. The abundance of aerial photography and time-lapse work takes in sights that would be nearly impossible to experience firsthand. For those who enjoy armchair travel, this one has some great things to see.